Champions Pietà Hotspurs chalked up their 18th win of the season to celebrate their Division One title in style after hammering Gudja United 7-2. Needing three goals to overhaul St Andrew’s striker Trayo Grozev at the top of the leading scorers’ list, Pietà’s Raphael Kooh Sohna accomplished his mission after hitting a poker yesterday to finish as the league’s top marksman with 28 goals. The Cameroonian may have increased his tally but his participation came to an end 20 minutes from time after he picked up a knock. Four minutes into the game, Kooh Sohna’s free-kick was saved for a corner by Matthew Xerxen, the Gudja goalkeeper. From the resultant corner, taken by Andrew Spiteri, Orosco Anonam headed just wide. The champions continued to attack. On 13 minutes, Chilean midfielder Jonathan Zarate released Kooh Sohna who fired a low shot past Xerxen. Pietà doubled their lead on 19 minutes, Juergen Pisani hitting home after good work by Attard and Ricardo Costa. Seven minutes later, Kooh Sohna scored his second after being put through by Zarate. With three minutes remaining before half-time, Gudja gained a lifeline when Ryan Dalli drove the ball home after connecting with Peter Paul Sammut’s cross from the left. But, two minutes later, Kooh Sohna used his strength to pull away from Clive Fenech and complete his hat-trick for his 27th goal off the season. Fenech claimed to have been fouled by the Cameroonian striker but referee Stefan Pace dismissed his protests. On 53 minutes, Gudja reduced the arrears when Anthony Ewurum slotted the ball home following a good cross by Andrea Scozzese. Within five minutes, Pietà had restored their three-goal lead when Kooh Sohna struck his fourth with a fine shot after reaching an inviting cross from Pisani. Nine minutes from time, Ricardo Costa gave the scoreline a tennistic look. The Brazilian took advantage of an error just outside the Gudja area, ran at the defence and slotted the ball home from close range. Cleaven Frendo made it 7-2 with five minutes to go, hitting home from Jerry Ani’s cross. 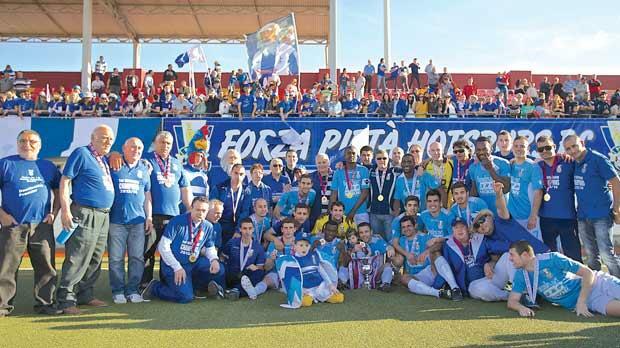 At the end of the match, MFA vice-president Alex Manfrè presented the Division One championship trophy to Christian Grech, the Pietà captain. Gudja United: M. Xerxen, R. Buhagiar, E. Bugeja, C. Fenech, M. Brincat, A. Scozzese, G. Chircop (G. Debattista), P. P. Sammut (C. Portelli), R. Dalli, M. Groves, A. Ewurum. Pietà Hotspurs: D. Cassar, C. Attard, C. Grech, O. Anonam, J. Pisani, J. Zarate, T. Agius (C. Frendo), K. Cesare, A. Spiteri (Q. Refalo), Ricardo Costa, R. Kooh Sohna (J. Ani). Man of the match: Raphael Kooh Sohna (Pietà Hotspurs). Gżira United ended their commitments with a narrow 2-1 victory over Melita in a meaningless match that became a dull affair in the second half. The Maroons deserved their victory as they were the better side and could have won by a bigger margin had they converted the scoring chances that came their way. After 15 minutes, Melita goalkeeper Philip Schranz effected a double save on Martin Kotyza. Moises Avila Perez, Gżira’s Spanish striker, then failed to make contact from underneath the crossbar to miss a golden opportunity. Melita responded a minute later but Kurt Coleiro’s grounder finished just wide. On 20 minutes, Steve Meilak dribbled his way through on the left before hitting a scorcher which was blocked by Schranz. Gżira forged ahead 10 minutes from half-time. Avila Perez headed the ball into the path of Shawn Vella who buried home. Melita drew level two minutes later when Gżira stopped for an offside that never came and Coleiro scored from close range. Gżira came close again on 40 minutes but this time Vella sent the ball wide from just inside the box. But, two minutes from half-time, Gżira scored what proved to be the winner. As Mamo controlled the ball badly, Avila Perez nipped in to steal the ball and run past the Melita custodian before driving the ball into an empty net. The second half was utterly boring with neither goalkeeper having a notable save to make. Gżira United: K. Gerada, R. Deguara (S. Bonello), R. Forace, A. White, J. Chetcuti, B. Bondin, Y. Tonna, M. Kotyza, M. Avila Perez, S. Meilak (D. Ciantar), S. Vella (L. Camilleri). Melita: P. Schranz, L. Bianco, M. Borg, M. Mamo, L. Sammut, N. Rizzo (G. Schranz), L. Micallef, K. Coleiro (L. Mifsud), A. Attard (L. Zammit), J. Da Silva, A. Borg Olivier. Man of the match: Moises Avila Perez (Gżira United).